Suitable for 'a' and 'b' class of fires involving materials like paper, wood, cotton, petroleum products, paint pigment and varnish. Class a : ordinary combustible or fibrous material, such as wood, paper, cloth, rubber and some plastics. Foam Extinguishers are not suitable for fires involving electrical risk. Don't use on Electrical Fire. 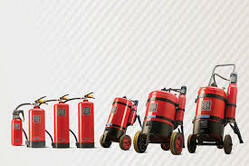 We are committed to offer our clients, a wide collection of Mechanical Foam Type Fire Extinguisher. These are manufactured by the professionals of our valuable vendors following the flame knock down technique for spill fires involving flammable and volatile liquids like petrol, paints and alcohols. The offered extinguishers find their applications in offices, petrol stations and offices. a. 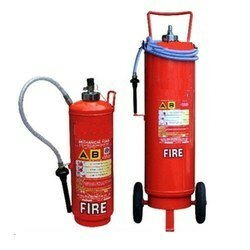 Foam Based Automatic Portable Fire Extinguisher & Prevention Apparatus with Automatic and Manual Dual Operation.